Platelet-activating factor (PAF; 1-O-alkyl–2-acetyl-sn-glycero-3-phosphocholine; Fig. 7-1) is a potent bioactive lipid, with a diverse array of biologic effects in isolated systems, and which has as many roles in inflammatory states in vivo. 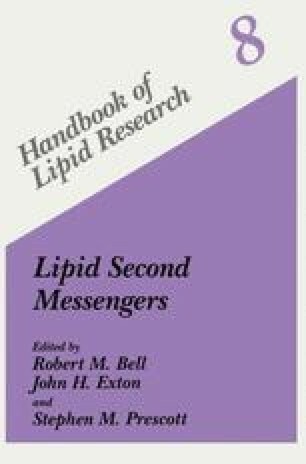 Its name comes from observations in 1972 that a lipid extracted from the blood of rabbits undergoing anaphylaxis caused ex vivo activation of platelets (Benveniste et al., 1972). At about the same time, other investigators found that a lipid extracted from kidneys lowered blood pressure in an animal model (Blank et al.,1979). Subsequent elucidation of the structure of these compounds showed both to be 1-O-alkyl–2-acetyl-sn-glycero-3-phosphocholine. Although the name derives from its original description as an activator of platelets, it belies the vast array of other actions known to be mediated by this potent lipid. In fact, activation of platelets may be its least important role: rats, and many of their isolated cells, respond to PAF, but their platelets are resistant as they lack the high-affinity receptor for PAF.